In a way, choosing a favorite airport is akin to choosing a favorite hospital: Conveniences and accouterments aside, nobody really wants to be there in the first place, and the easier and faster you can get the hell out, the better. 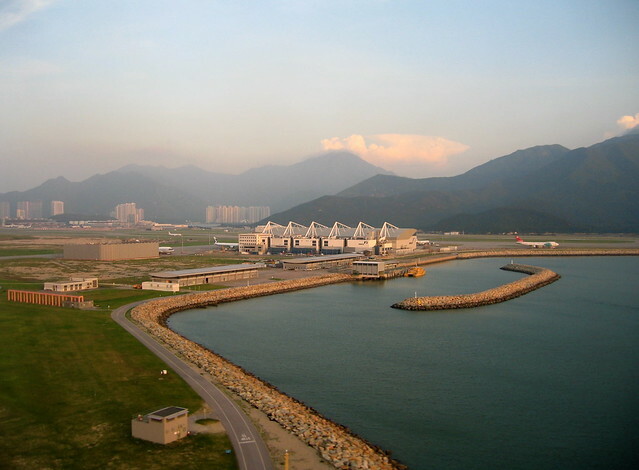 Which brings us to HKG’s most impressive and appealing feature: its rail connection to the city. The sleek, high-speed Airport Express train is literally only steps from the arrival and departure halls. Compare the best of Asia with, for example, my hometown airport, Boston-Logan. My commute to the airport by public transportation takes almost an hour and requires two changes, including a ride on the Silver Line bus, which, in addition to being at the mercy of automobile traffic, requires, at one point, that the driver step out and manually switch power sources to the bus. Or how about JFK, where for hundreds of millions of dollars they finally got the AirTrain completed — an inter-terminal rail loop that can’t take you beyond the Queens subway. Heck, it can take 45 minutes, up and down a byzantine array of escalators, elevators and passageways, just to get from one terminal to another, let alone all the way to Manhattan. The distance from Shanghai airport to the city is about 20 miles — roughly the mileage from JFK to midtown. Shanghai’s bullet train covers this distance in seven minutes. This is why the Chinese are beating the US! Well, okay, not really. And I even had to take a cab from the end of the line to my hotel in Shanghai. But that seemed like the right thing to say. And maybe it’s even kind of true, in the end. The US can’t manage basic train connections from its international airpots to its effective capitol cities (IAD-DC, JFK-NYC), and you can roll (levitate!) from PVG to Shanghai in 7 minutes. To be fair, not every Asian terminal is so astoundingly convenient. Seoul, Bangkok and Taipei top a list of those without high-speed rail options. To top it off, everybody at Taoyuan was unfailingly polite, from the immigration officer to the man at the currency booth. And isn’t this how it should be? In the end, an airport is more than just a place to kill time, more than an annoying conduit between ground and sky. It’s an expression, a gesture, a statement. It’s a welcome to, and a farewell from, the place you’re visiting or coming home to. In much of the world — not only Asia but throughout Europe as well — they have figured this out. I am absolutely and completely onboard with his “in the end” thought. The idea that a significant international airport should well represent the country it’s a gateway to is the thing that keeps me railing against JFK (seriously, *that* is the first thing that people see when they arrive in the US?) and LAX (Just shoot it. Please.) while I’m in awe of YVR (Vancouver). Airports are amazing spaces for humanity. The US needs to do a better job of respecting and supporting that. *Funny part: when I landed at HKG, it was the end of the longest flight I’ve ever been on – almost 17 hours from Newark. I stumbled to the car service, never once looking up. And on the way out, I was ten kinds of late, so ran through the terminal without once looking up. Yep, I somehow managed to retain zero memories about the biggest indoor space in the world, with the exception of some escalator that ended up taking me where I didn’t need to be (compounding the lateness). Well done! Contrary to what your eyes tell you, I miss this place. Let’s start it back up with some music. There are loads of “punk covers” out there, and they’re almost uniformly crap. (Like most self-identified punk music, actually, but that’s for another time.) But this cover of the Foundation’s Build Me Up Buttercup by the Goops? Tops the original, in my book. Easily. P.S. – I saw the first daffodil open along the Potomac today.